Notion #83—AKA the totally sprung Spring issue—dives headfirst into 2019 with some of our favourite musical talent including cover stars Ms Banks, Loyle Carner, Madison Beer and Tierra Whack. Inside we hang tough with the likes of Joji, Obongjayar and Maverick Sabre, meet fresh faces like Role Model and take an in-depth look at Ireland’s hip-hop scene. 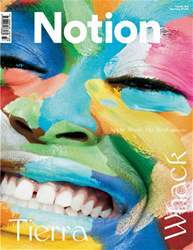 Plus there’s fashion features with Rico Nasty, Nakhane, Weyes Blood and Kailand Morris!